(852) Her kan man linke til interessante blogindlæg om klimadebatten.
" When people come to know what the truth is,they will feel decieved by science and scientists." Can climate models explain the recent stagnation in global warming.? Storch har i tidligere interviews udtalt sig i noget tvetydige vendinger om klimamodellernes validitet og prognoserne for fremtidens klima. H.v.S. har følt, at han er blevet fejlfortolket af flere medier - og måske er han af "Det øverste råd",IPCC,blevet presset til at korrigere og præcisere sine udtalelser,inden AR5 bliver præsenteret for politikerne og meningsdannerne sidst i september 2013. "The Little Ice Age (LIA) was a time of global cooling from approximately 1350 to 1870 AD. During this time glaciers expanded in the northern regions, moving down the mountains and scouring the vegetation that had been in the valleys below. Park Service personnel recently discovered evidence of a buried forest dating back to at least 1170 AD high in the Forelands near the current glacier's edge." University of Copenhagen, UCPH, will launch an entirely new international climate change programme that will qualify students to address climate issues from the frozen Arctic in the north to tropical Bangladesh further south. Unique about the Climate Change programme is that it will formally abandon typical disciplinary boundaries between the natural and social sciences. This means that up-and-coming graduates will have been trained in, among other things, geophysics, geography, social-economic affairs and security policy. In this way, graduates will be trained to operate and work among a broad range of issues while still being attuned to local conditions, whether abroad or in a Danish municipality. Sunspot numbers jumped from a daily average of 57 in July to an average of 66 in August. The jump was due entirely to an increase in northern hemisphere activity. Southern activity remained steady compared to July. It is odd that a resurgent northern hemisphere stopped dead in its tracks for about a week in the middle of August. Why? Could it be that the polarity shift has already begun? The jump in August sunspot numbers is consistent with the sun's behavior during a polarity shift. The trend over the last three solar cycles has been for weaker 2nd half activity. 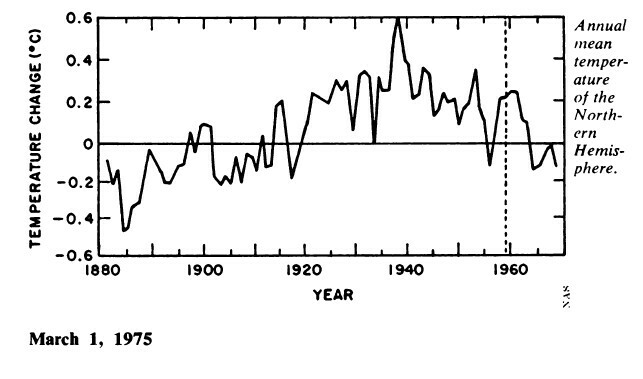 This makes perfect sense given the general decline in sunspot magnetic field strength over time. A weaker 2nd half of Cycle 24 the most likely scenario. The most exciting part of the polarity shift is that afterward more indicators about the strength of Cycle 25 will begin to show up. We are at the beginning of a profound change in the sun. What it means and how it will affect climate change over the next decades is the biggest unknown in climate science today." The most exciting part of the polarity shift is that afterward more indicators about the strength of Cycle 25 will begin to show up. We are at the beginning of a profound change in the sun. What it means and how it will affect climate change over the next decades is the biggest unknown in climate science today." Ja det er måske en anelse svært det der med forudsigelser om solens fremtidige opførsel og dens indflydelse på vort klima. "Jeg har fulgt med blandt andet hos Nasa hvor en af verdens førende soleksperter David Hathaway skråsikkert har forudsagt at SC 24 vil starte juli 2004. Den vil blive meget voldsom med fare for store ødelæggelser her på jorden og blandt vore satellitter. "Solens aktivitetsniveau har for øvrigt absolut ingen indflydelse på vort klima", så ved du det!!!! Nu har den gode Hathaway imidlertid udsat starten af SC 24 nogle gange. Hver gang er hans forudsigelser blevet ramt af solens evindelige fortsættelse af SC 23. Nu er det ganske vist at SC 24 starter juli 2009 og den vil blive ekstrem lav. Nøjagtigt som forudsagt af David Hathaway. Som Storm P. udtrykte det: "Det er svært at spå, især om fremtiden"
Det er ikke 10 år siden vi blev advaret af førende videnskabsfolk om en nært forestående faretruende voldsom aktiv sol og nu mindre end 10 år efter ser vi resultatet af den faretruende voldsomme aktive sol. Nu fortæller den samme Hathaway at solen er usædvanlig stille og gået i dvale. Der tales sågar i videnskabskredse om at vi er ved at bevæge os ind i et nyt Grand Minimum. Så meget for videnskabens PREDICTIONS. svarer på spørgsmål om temperaturens stagnation,modelberegninger, IPCCs AR5 og naturlige klimapåvirkninger etc. Om forskningen omkring naturlige påvirkninger som, solens aktivitet og kosmisk stråling siger han :" in diese Bereiche ist weniger Hirnschmalz investiert worden durch die internationale Klimaforschung." "in diese Bereiche ist weniger Hirnschmalz investiert worden durch die internationale Klimaforschung." på disse områder mindre hjernekraft er blevet investeret af den internationale klimaforskning. "The Coalition, led by Tony Abbott, is on the verge of regaining power after the worst six years of government in Australia's Federal history. The Rudd-Gillard-Rudd-again experiment proved to be the most untrustworthy, incompetent and arrogant administration one could conceivably imagine. Broken promises, failed policies, epic waste, smear, lies and corruption lay strewn in its wake. Labor's shabby deal with the Greens in 2010 was bought with a promise of urgent action on climate change, which gave Australia the most pointless emissions tax on the planet." "Mr Abbott promised he would do whatever was necessary to ''scrap the tax'' within his first year in government, even if it meant getting blocked in the Senate and sending Australians to another election through a double dissolution." PRIME Minister-elect Tony Abbott has personally instructed his new departmental secretary to make preparations to axe the carbon tax and activate Operation Sovereign Borders to stop asylum boats. (378) Blogsiden starter med følgende citat, hvilket IMO sætter den politiske agenda over det videnskablige. The Coalition, led by Tony Abbott, is on the verge of regaining power after the worst six years of government in Australia's Federal history. The Rudd-Gillard-Rudd-again experiment proved to be the most untrustworthy, incompetent and arrogant administration one could conceivably imagine. Broken promises, failed policies, epic waste, smear, lies and corruption lay strewn in its wake. Ja, den om korruption passer vist ikke med situationen i Danmark, men ellers stemmer det vel meget godt? "Australia's landslide election result seems to be bad news for the climate. Following the election of a new government, Australia is to abolish its emissions trading scheme, disband a climate advisory body and institute a carbon reduction policy that experts say will fail to meet its meagre target." A Danish group that has reproduced the Earth's atmosphere in the laboratory has shown how clouds might be seeded by incoming cosmic rays. The team believes that the research provides evidence that fluctuations in the cosmic-ray flux caused by changes in solar activity could play a role in climate change. Other climate researchers, however, remain sceptical of the link between cosmic rays and climate. In recent months it has been stated repeatedly that 97 per cent of scientists agree global warming is real and man-made. These claims are based on a paper published by a team led by John Cook in the journal Environmental Research Letters. The authors, all associated with controversial global warming activist website Skeptical Science, concluded that 97 per cent of papers expressing a view endorsed the "consensus" position that humans were causing global warming. The paper received an extraordinary reception, being downloaded more than 20,000 times in the first few days after it was published and receiving hundreds of citations from around the internet. There was therefore an asymmetry in the classifications, with papers accepting the influence of a large or an unspecified level of human influence included in the consensus, and only those actively minimising the human influence recorded as rejecting it. This leads to the unavoidable conclusion the consensus as revealed by Cook et al was indeed the shallow one. That consensus is therefore virtually meaningless and tells us nothing about the present state of scientific opinion, beyond the trivial observation that almost everybody in the climate debate agrees carbon dioxide is a greenhouse gas and human activities have warmed the planet to some extent. As Mike Hulme, founder of the Tyndall Centre, Britain's national climate research institute, put it: "The (Cook et al) article is poorly conceived, poorly designed and poorly executed (and it) obscures the complexities of the climate issue." The paper is, on close examination, a damp squib. People have been asking me to comment on the leaked IPCC Final Draft Summary for Policy Makers. Apparently someone in the IPCC made the Report available to 'friendly' journalists, as part of a strategy to brief them before the formal release of the Report. I have declined to comment until very recently, since I thought it was best to let the IPCC process play out. Now it is clear that the leaked report has made it into the hands of journalists that were not on the IPCC's 'friends' list. I have now seen a copy of the SPM, and I provided comments to David Rose (and also to another journalist, not sure when that will air). What interests me the most about the AR5 report is how the IPCC is changing its positions and statements relative to the previous AR4 report. It is particularly interesting to see how the different drafts of the AR5 Summary for Policy Makers are changing. I am very grateful that these drafts have been leaked, as these drafts provide important insights into the reasoning behind the IPCC conclusions and confidence levels. The IPCC should of course change its conclusions and confidence levels in response to new scientific evidence and analyses. Because of the rapid pace of publication of papers over the past year that challenge aspects of the AR4 conclusions, the slow ponderous assessment process of IPCC has been apparently having difficulty in responding to and assessing all this, as evidenced by the substantial changes in the drafts. My main point is this. If there are substantial changes in a conclusion in the AR5 relative to a confident conclusion in the AR4, then the confidence level should not increase and should probably drop, since the science clearly is not settled and is in a state of flux." (852) German Professor: "IPCC Science Finds Itself In A Serious Jam...5AR Likely To Be The Last Of Its Kind"
And: "Extreme weather is the only card they have left to play." So says German Prof. Fritz Vahrenholt, who is one of the founders of Germany's modern environmental movement, and agreed to an interview with NoTricksZone. He is one of the co-authors of the German skeptic book "Die kalte Sonne", which took Germany by storm last year and is now available at bookstores worldwide in English under the title: The Neglected Sun. Real science is always provisional, open to correction, and tentative in its conclusions. Scientism on the other hand is an ideological stone – unmovable and inflexible. Thus real scientists will be open to evidence, while the true believers will allow ideology to trump the facts. We certainly see this played out in the global warming hype. For many this has simply become an article of faith. One must subscribe to anthropogenic global warming, or be hounded out of the public arena as a heretic and renegade. And this despite the fact that thousands of scientists don't buy the AGW hype. But you know things are really beginning to unravel when the big cheese groups pushing all this finally start admitting that they may have gotten things wrong. The Intergovernmental Panel on Climate Change is now finally admitting that their computer projections may have greatly overstated the case on global warming. (852) A Turning Point for the IPCC...and Humanity? Worldwide momentum is shifting. With David Rose's article in the Daily Mail, Matt Ridley in the Wall Street Journal ("We got it wrong on warming"), and the excellent article by Ross McKitrick in the Financial Post the skeptical message is going mainstream. The war is by no means over, but the race in media coverage has stepped up a notch. Now, for the first time there is an element of competition, serious newspapers don't want to be left behind. Editors have realized the skeptics have a case. (1892) Hvad der er politisk korrekt (som vi vil sige på dansk) har stor betydning for hvordan både medierne og politikkerne behandler problemet. I 1990érne oplevede vi hvor den politiske holdning skiftede på flygtninge- og indvandreområdet her i landet. Det fik som bekendt stor betydning for den førte politik på dette område. Noget tilsvarende kan meget vel sket på CO2- og klimaområdet. Hvis ikke der fremover sker stigninger i den globale gennemsnitstemperatur, så er der kun et spørgsmål om tid, før dette holdningsskifte slår igennem. Jeg tør dog ikke sige noget konkret om hvor mange år der skal gå uden temperaturstigninger, før dette holdningsskifte slår igennem. Antageligt er der kun tale om relativt få år. Holdningsskiftet er jo allerede så småt ved at slå igennem. A few weeks ago, I ran a post Overestimated global warming over the past 20 years that referred to a recent paper published in Nature Climate Change by Fyfe et al. 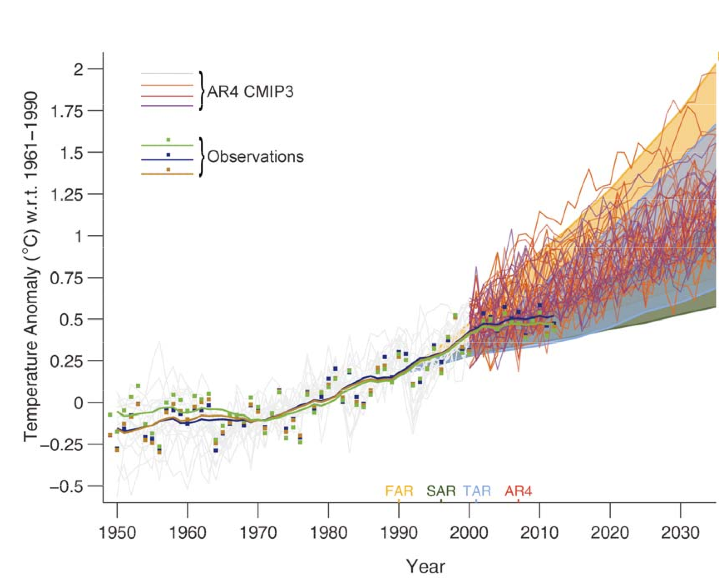 This paper starkly laid out the discrepancy between CMIP5 model projections and observations of global surface temperature change. This wasn't exactly news to those of us who follow the skeptical blogosphere; we have seen similar analyses by John Christy (presented in his Congressional testimony) and the analysis of Ed Hawkins that was made famous by David Rose's article. My blog post on the Fyfe et al. paper triggered an email from Pat Michaels, who sent me a paper that he submitted in 2010 to Geophysical Research Letters, that did essentially the same analysis as Fyfe et al., albeit with the CMIP3 models. No credence should be given to IPCC's last-minute attribution of the discrepancy to "natural variability". IPCC's ad hoc analysis purporting to support this claim does not stand up to the light of day. The idea that IPCC needs to be up to date on what was written last week is just ridiculous." But the problem not arise "last week". While the issue has only recently become acute, it has become acute because of accumulating failure during the AR5 assessment process, including errors and misrepresentations by IPCC in the assessments sent out for external review; the almost total failure of the academic climate community to address the discrepancy; gatekeeping by fellow-traveling journal editors that suppressed criticism of the defects in the limited academic literature on the topic. That academics (e.g. Fyfe et al here; von Storch here) have finally begun to touch on the problem, but only after the IPCC deadline must surely add to their frustration. Von Storch neatly summarized the problem and calmly (as he does well) set it out as an important topic of ongoing research, but any investor in the climate research process must surely wonder why this wasn't brought up six years ago in the scoping of the AR5 report. With around 20% of the country under sea level, the Dutch have a keen interest in anything that might affect their environment, such as climate change. But scepticism about the human influence on global warming has been growing in the Netherlands, according to research from the OECD. In a country where consensus is a key word, the government has taken a more inclusive approach to climate dissenters. To that end, they have funded Marcel Crok to carry out a sceptical analysis of the IPCC report. In an effort to build bridges between sceptics and the mainstream they are also funding an initiative called climatedialogue.org which serves as a platform for debate on the science of global warming. 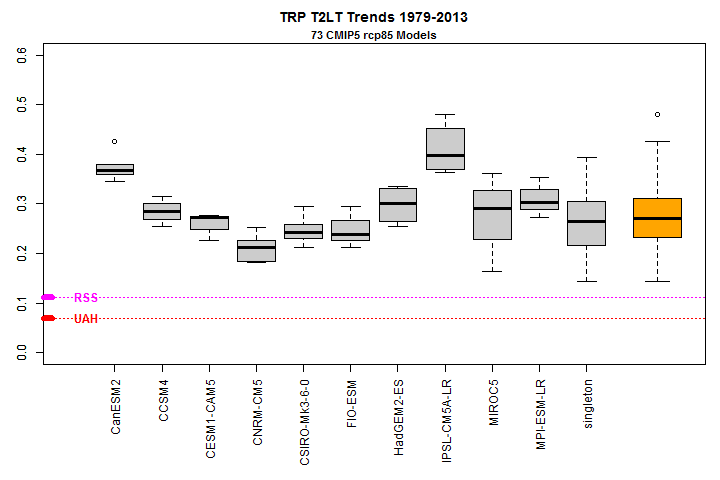 "The long-term climate model simulations show a trend in global-mean surface temperature from 1951 to 2012 that agrees with the observed trend (very high confidence). There are, however, differences between simulated and observed trends over periods as short as 10 to 15 years"
"Models do not generally reproduce the observed reduction in surface warming trend over the last 10&#8201;–15 years." "It is extremely likely that human influence on climate caused more than half of the observed increase in global average surface temperature from 1951&#8722;2010." These changes as a result of the 'conclave' this week totally dissonates my cognitives. Well, IPCC has thrown down the gauntlet – if the pause continues beyond 15 years (well it already has), they are toast. Even though they still use the word 'most' in the attribution statement, they go all out and pretty much say it is all AGW: "The best estimate of the human induced contribution to warming is similar to the observed warming over this period." (4838) Nogle interessante kommentarer til AR5 kan læses her. Lars Lykke har ellers sagt at det vigtig at holde partistøtten hemmelig fordi ellers er for folk som ikke vil stemme på et parti fordi det har fået støtte fra nogle som vælgeren ikke sympatisere med. Dels har vi i Danmark støtte mange korrupte folk i udlandet. "My original intention for this thread was to go through and try to map the IPCC's logical argument. I quickly got dizzy owing to seemingly unwarranted assumptions and incomplete information (such as: did the climate models use the correct external forcing for the first decade of the 21st century, or not?). I was then going to illustrate how any reasonable propagation of uncertainty of individual assertions/arguments through their main argument would produce much lower confidence in their overall conclusions. For example, they seem to have eliminated high CO2 sensitivity as a problem. Not to mention high confidence in increasing trend following 2012 (this high confidence comes right after blowing the prediction of the previous decade). And of course not to mention the relevant journal articles that didn't get mentioned. Apart from these obvious flaws, reading that text and trying to follow it is positively painful. Can someone remind me again how and why all this is supposed to be useful?" 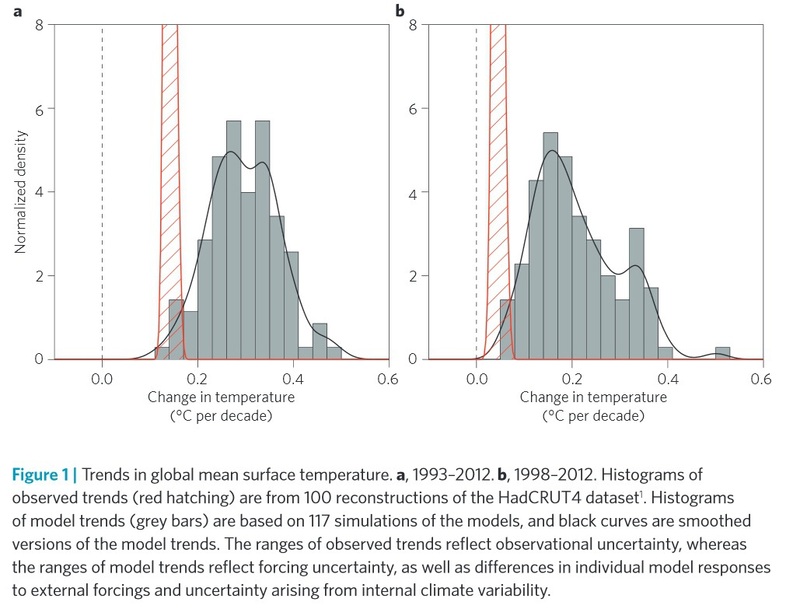 "Figure 1.4 of the Second Order Draft clearly showed the discrepancy between models and observations, though IPCC's covering text reported otherwise. I discussed this in a post leading up to the IPCC Report, citing Ross McKitrick's article in National Post and Reiner Grundmann's post at Klimazweiberl. Needless to say, this diagram did not survive. Instead, IPCC replaced the damning (but accurate) diagram with a new diagram in which the inconsistency has been disappeared." Eller von Storch et al. (2013) for den sags skyld. Men den almene "klimalede" i befolkningen og olie- og gasindustriens historiske jerngreb på verdensøkonomien er ikke det eneste, IPCC-forskerne skal kæmpe med for at få verden til at tage forskningen seriøst. Faktisk har der, i takt med at forskerne er blevet stadig mere sikre på, at den konstaterede globale opvarmning er menneskeskabt, rejst sig en stigende tvivl på, om man kan tro på det, klimaforskerne siger. Much has been made of the lack of agreement between the model projections and observations, with the observations being perilously close to falling outside the entire range of model projections. I discussed this disagreement in my Congressional testimony (in context of Ed Hawkins' diagram). von Storch et al. Can climate models explain the recent stagnation in global warming? The final WG1 Report provides the following version of Figure 1.4:"
(991) Jævnfør Szilas' link ovenfor, kan vi nu slippe for at høre om global opvarmning i forbindelse med enhver vejrbegivenhed, der ikke lige sker hver dag i Tølløse? IPCC siger altså, at det bør vi. There is really not much more to be said here -- the data says what it says, and what it says is so unavoidably obvious that the IPCC has recognized it in its consensus. Of course, I have no doubts that claims will still be made associating floods, drought, hurricanes and tornadoes with human-caused climate change -- Zombie science -- but I am declaring victory in this debate. Climate campaigners would do their movement a favor by getting themselves on the right side of the evidence.